The temperature isn’t the only thing rising in the summer. 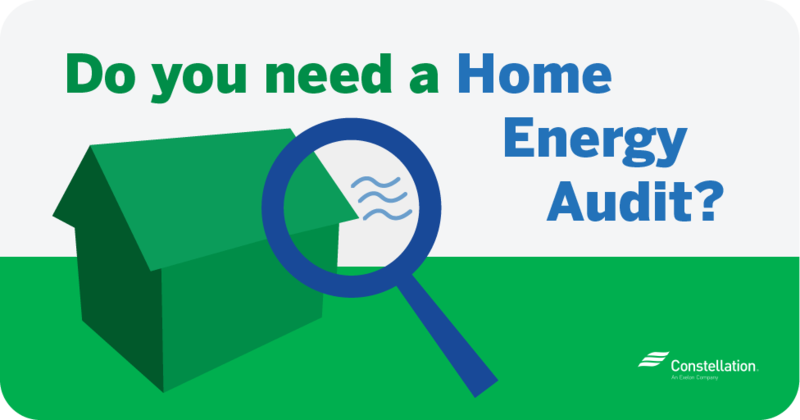 You might also be seeing an uptick on your energy bills as you turn up those air conditioners, run those pool pumps longer, and turn on fans. So, when the mercury’s rising, you might want some tips for how to save energy. In the summer, soaring temperatures don’t mean your energy bills need to reach record highs, too. Whether you’re enjoying the summer weather outside or from the comfort of your home, saving energy in the summer is attainable. 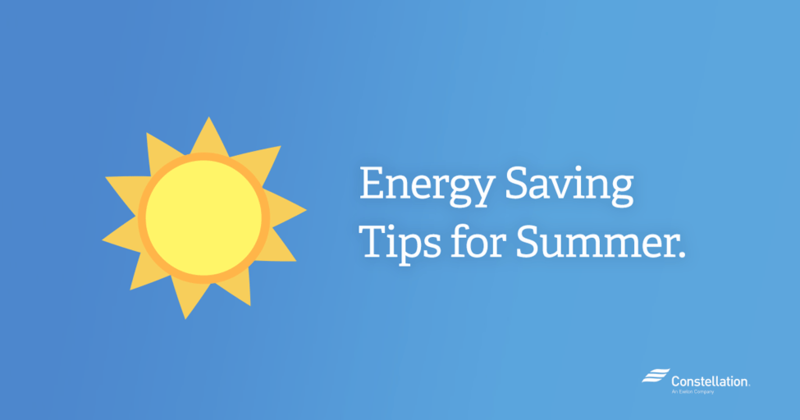 All you need to do is follow some of these energy savings tips for summer. Be a speedy chef. 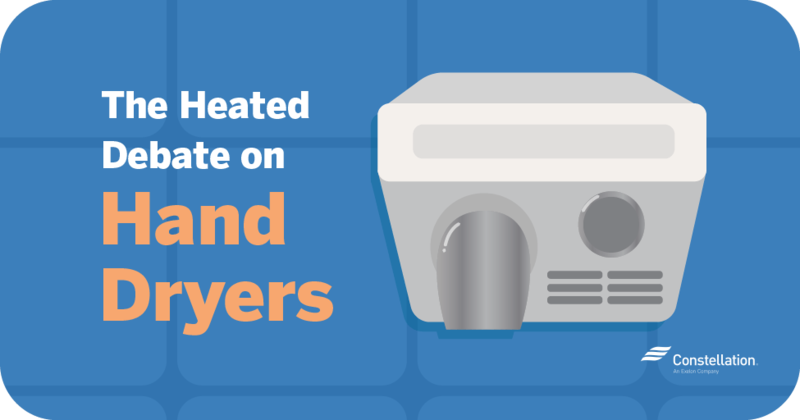 Use a microwave to heat up food rather than your oven. It uses less energy and keeps your kitchen cooler. Air-dry those dishes in the dishwasher, rather than running the dry cycle. Again, this uses less energy and keeps the kitchen cooler. Doing this can cut dishwasher energy use 15-50%, depending on the machine, according to Consumer Energy Center. 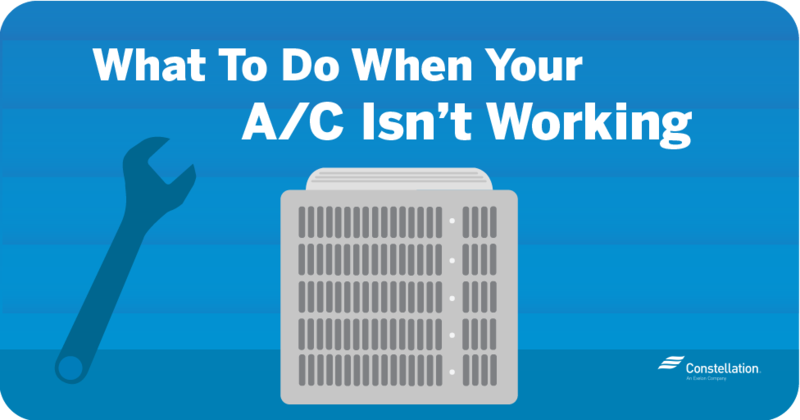 Turn up the thermostat up to 78 degrees when you’re home. Use ceiling fans or room fans to cool a room even when using air conditioning. It will keep the room cooler and use less air conditioning. Let the sun dry your clothes rather than the clothes dryer. Turn off appliances and lights when they’re not in use. The Consumer Energy Center estimates you can save 2% in energy costs on this one simple change alone. Unplug electronic devices and chargers when they’re not in use. Install outdoor solar lighting. Sunlight costs nothing, so let the sun’s rays light your yard.. Switching to a high-efficiency air conditioner can reduce your energy use by 20-50%, according to Energy.gov. Install energy-efficient lighting. Only 10-15% of the electricity from incandescent lights results in light; the rest is turned into heat. Switch to ENERGY STAR® appliances. They use less energy and help the environment as well. 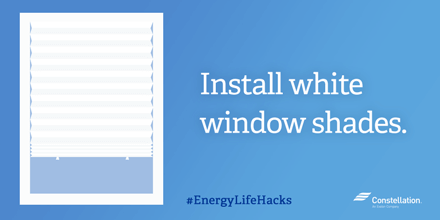 Install white window shades, drapes or blinds to reflect heat away from the house. Energy.gov says studies show that medium-colored drapes with white plastic backings can reduce heat gain by 33%. 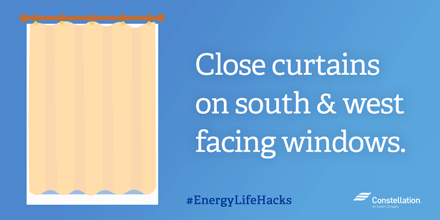 Close curtains on South- and West-facing windows during the day when the sun is at its hottest. Install awnings on South- and West-facing windows to help keep the sun’s rays at bay. Energy.gov notes that window awnings can reduce solar heat gain by up to 65% on South-facing windows and 77% on West-facing windows. Awnings can be used for one or two windows or entire sides of homes, depending on your home and climate. 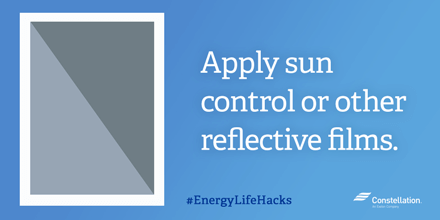 Apply sun control or other reflective films on South-facing windows to reduce the impact of solar heat. Consider mesh window screen. 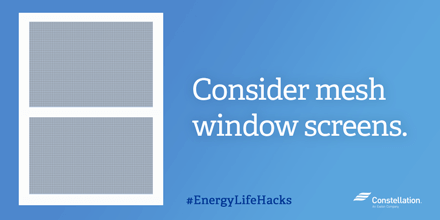 These can diffuse solar radiation, especially on East- and West-facing windows. They should be mounted in an exterior frame and cover the entire window. Awnings: Awnings have a come a long way from the days when metal and canvas were the only material options. Today’s awnings are made from synthetics that are water-repellent and treated to resist mildew and fading. Energy.gov recommends choosing material that is opaque and tightly woven — ideally, light-colored — to get the best protection from the sun’s rays. Blinds: Energy.gov says that interior blinds are particularly useful for summer energy conservation because, unlike shades, the slats can be adjusted to control light and ventilation. When completely closed and lowered on a sunny window, Energy.gov notes that highly reflective blinds can reduce heat gain by about 45%. Window films: High-reflective window films are another strategy for saving energy in the summer. Their effectiveness depends on a a few variables: size of the window-glazing area; direction the window faces; climate; how the building is sited; and whether the window has interior insulation. Silver, mirror-like films are usually more effective than colored, more transparent ones. They also offer the best summer energy conservation if they are placed on East- or West-facing windows. Before considering window films, do consider that there are a few potential disadvantages: some loss of interior light; impaired outside visibility; cleaning requirements; and reflection. Window films can be applied by homeowners over existing windows. Overhangs: A roof overhang works best as a summer energy conservation option if it helps shade South-facing windows. Properly-installed overhangs should still allow sunlight to filter through the windows in winter. Shades: A properly installed window shade can be the simplest way to save energy in the summer. Shades should be lowered on windows that receive sunlight during the day in the summer. They should be mounted as close to the glass as possible so that the shade creates a sealed air space when lowered. Dual shades that are white (highly reflective) on one side and dark (heat-absorbing) on the other offer the most energy saving potential, thanks to their versatility. The reflective side should always face the warmest side — outward in the cooling season and inward during the heating season. Quilted roller shades or Roman shades (the type with layers of fiber batting) can also help save energy. They can act as insulation and also can control air infiltration more effectively than other soft window treatments, Energy.gov notes. Shutters: Interior and exterior shutters can help with heat gain and loss. Energy.gov notes that exterior shutters likely offer the best window insulation option over interior shutters. In addition to offering weather protection and added security, they require no interior space. Solid interior shutters are best for summer energy conservation. Consisting of wood panels and a potentially decorative covering, they provide a good insulating air space when fitted tightly against a window frame. 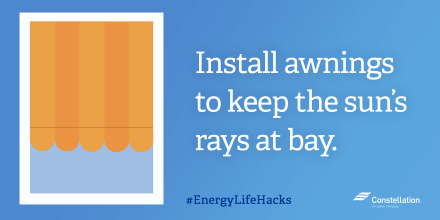 For more energy saving tips for summer and beyond, check out 31 Days of Savings. We are senior citizens on a fixed income and do all of the above but because we conserve we get charged a minimum usage fee. It really defeats the purpose of trying to control our usage. Hi, Elaine: I can certainly understand your frustration in feeling like you’re doing everything right, but not seeing the savings. Not all of our products have a minimum usage fee. Let’s see if we can find a plan that better suits your needs. I’m going to have someone from Customer Service follow-up directly with you. Thank you for taking the time to comment, Thomas. I am so glad that this has been helpful to you. Please check back soon for even more tips and tricks for savings!